Worcester County MD’s Woodland Sheds Inc. carries outdoor sheds of almost every type and in just about every size and shape you can imagine! You name it… we have it! Wood sheds, Garden sheds, Yard sheds, Outdoor Storage sheds, Barn sheds, Tool sheds, Utility sheds and special Custom made sheds, too. Sheds have always been the core of the business and Woodland maintains one of the Delmarva and Ocean City MD region’s largest inventories of high quality Amish Built Wooden sheds that can be found anywhere east of the Chesapeake Bay! Over 30 years of working with some of the finest Amish craftsmen in Pennsylvania has helped make Woodland Sheds one of the Eastern Shore’s leaders in quality, service and installation of buildings and products designed to add to the value of your home. 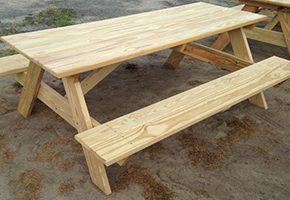 Woodland Sheds sells only the finest in quality wooden products. The Woodland family has been selling quality built sheds and storage units from the same location along Worcester Highway for over 30 years! Now operated by Herb Woodland, Jr., the family business has been expanded to include much more than just wooden outbuildings. Our Sheds, buildings and garages that are ready for immediate pick up or delivery. Do you only sell Amish made wooden sheds? Not at all. Because vinyl sheds and products have come such a long way in design and construction over the past few decades, we now carry an expanded selection of storm rated heavy-duty sheds for sale to both year round and seasonal homeowners. Woodland Sheds even carries a large selection of high quality vinyl Garages. Which kind of shed is better? Wood or Vinyl? It all depends on what your needs are. 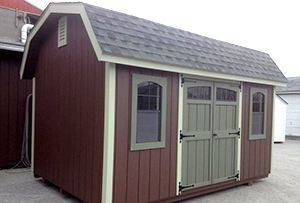 Woodland Sheds carries a full line of high quality products that are all built to last for years. With over 30 years of experience installing and servicing everything that we sell, the Woodland family can help you select the right product…and at the right price to fit your budget. Do you personally install what you sell? Professional installation and setup of a freestanding garage, shed or outbuilding is essential to its stability and endurance. Three generations of Woodlands have the knowledge and experience to make sure that your building is properly set up to last for years. Woodland Sheds will make sure that everything from the base to the roof is built to exacting specifications, assuring our long list of customers that we will back up every product we sell. Woodland Sheds is conveniently located and easy to find on the corner of Bishopville Rd. and US Route 113, just a few miles north of US Route 50, and less than a minute away from the Delaware state line. Stop on by, pick out exactly what you are looking for and Woodland Sheds will deliver it right to your home or business. Yes. Woodland Sheds offers FREE DELIVERY AND SET UP to hundreds of locations all over the lower Eastern Shore of MD/DE, Delmarva, including Queen Annes County, Ocean City, Worcester County, Wicomico County, Dorchester County, and Somerset County in Maryland, plus Sussex County and Kent County in Delaware. Our free delivery area includes the cities of Salisbury, Princess Anne, Crisfield, Westover, Mardela Springs, Pocomoke, Snow Hill, Bishopville, Berlin, Ocean City, West Ocean City, Fruitland, Hebron, Nanticoke, Vienna, Cambridge and Easton, MD as well as to Georgetown, Laurel, Seaford, Dagsboro, Frankford, Selbyville, Roxana, Millville, Ocean View, Gumboro, Delmar Fenwick, Fenwick Island, Bethany Beach, Rehoboth Beach, Lewes, Long Neck, Milford, Milton, Millsboro, and Bridgeville, DE. We also help in relocating your shed and will even haul away old existing sheds if possible. Three generations of Woodlands continue to stand behind everything that we sell to the homeowners and businesses who come from all over the Delmarva Peninsula! Woodland Sheds now carries a complete line of quality crafted wooden sheds and garages built by Amish from Pennsylvania, plus vinyl sheds. Come and take advantage of our 30 years of experience in helping you select just the right outdoor storage unit, or garage for your home. If we don’t have the wood and vinyl building you want in stock and ready for delivery, we will have one custom made for you to the exact size and specifications you need. If you are looking for quality, service, and reliability on the Eastern Shore, stop by and visit Woodland Sheds, today! Provide your information and get instant approval. Quick and Easy! Review and complete the rental purchase agreement. Pay your security deposit and first month’s rent and we will schedule a delivery time. Deposit and first payment due before delivery, at signing. Your second payment will be due approximately one month after delivery. The deposit can be applied to either your EPO or last payment. You will not have to wait for a rebate check to arrive in the mail. No. It is rental purchase agreement. You are renting with an option to buy at any time. Can I pay extra principle? With Rent-to-Own there is no principle or interest. Any additional amount paid over the regular rental amount go towards your reserve account which can applied to the EPO at any time. Can I pay off early without a penalty? Call our friendly customer service representatives any time to receive your EPO. With our club program your building or garage is protected if it is damaged or destroyed. Plus you will have access to many other great benefits.